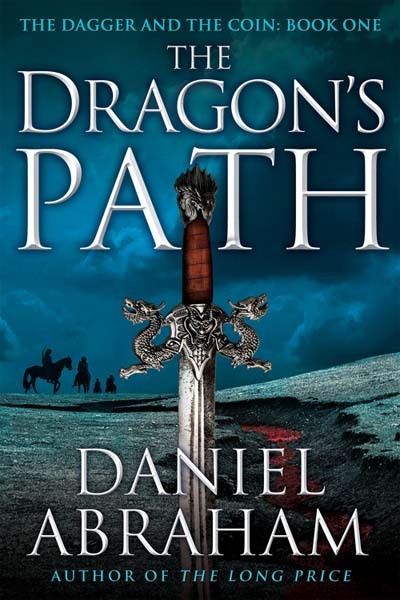 The Dragon's Path is book one in The Dagger and The Coin series. Following the paths of four major characters through out a world-building realm of 13 races in a land once ruled by dragons. Captain Marcus Webster is a veteran captain who is haunted by his past and becomes the "father-figure" and protector of rag tag group of miscreants. Cithrin Bel Sarcour is an orphan raised by the Medean Bank and with the banks guidance and tutelage, she is enlisted to smuggle the banks holdings out of town while a war is raging outside it walls. Geder Palliako, the heir of the Viscount of Rivenhalm, is more interested in his books and studies then being a catalyst in the story however, his uncharacteristic actions help set the fates of all those involved. Master Kit is the head of the theatrical troupe who has the gift of truth and more secrets than anyone could imagine. With these four we, the reader, are plunged into a world of magic, tyranny and mayhem. For the first 100 pages or so of the book I found it very hard to stay involved with the story. The different races were confusing at first as were the introductions of each of the main characters. There appeared to be a lack of plot flow as each of these aspects were being introduced. I would have liked a bit more time spent on each of the races or perhaps a glossary included with more information that couldn't be used in the plot. After the initial confusion, the author found his flow and the characters became more substantial and believable in form and character. I love the mystery surrounding Master Kit and his ability to see the truth in all situations it is a skill I would LOVE to have. As the story picked up and you had a clearer picture of where everyone was being headed the book became quite enjoyable and I am looking forward to the next segment of the fate of these folks lives. I wish to learn more about the Spider Queen and her involvement with these people, the history of the dragons and how they lost their rule and whether the truth will unfold as they all walk The Dragon's Path. Falling pebbles can start a landslide. A spat between the Free Cities and the Severed Throne is spiraling out of control. A new player rises from the depths of history, fanning the flames that will sweep the entire region onto The Dragon's Path-the path to war.